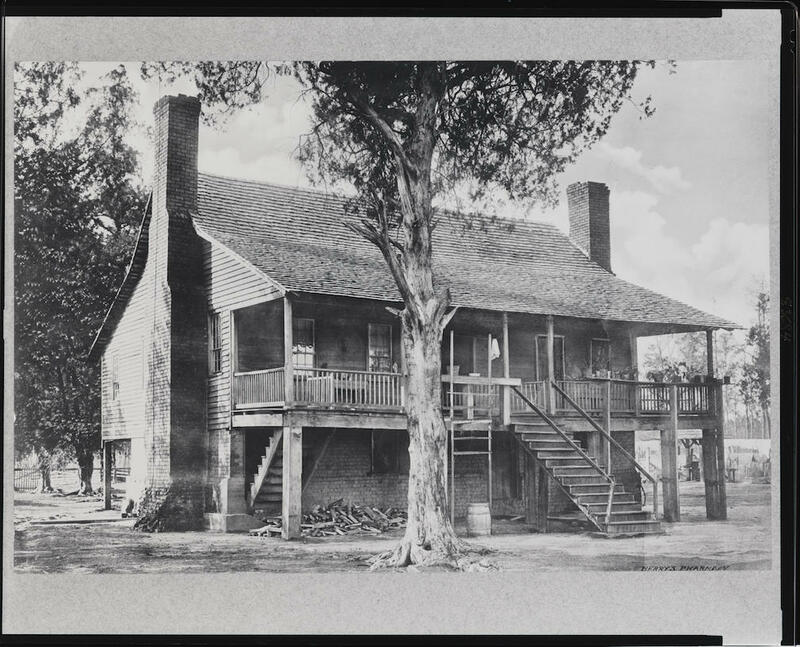 Located near Sandy Hook in southern Marion County, the John Ford Home, also known as Ford’s Fort, is the oldest frontier-style structure in the Pearl River Valley. Located on a plateau about a mile and a half west of the Pearl River, it is less than a mile north of the Louisiana border. Although oral tradition in the Ford family speculates that the house was built by a Spanish squatter before 1792, most evidence suggests that it was built by Rev. John Ford soon after his arrival in the state during the first decade of the nineteenth century. The house served as an important territorial military post, inn, and post office as well as the site of historic events in the state’s history, including the Pearl River Convention and early Methodist assemblies. John Ford was born in 1767 in South Carolina, one of several sons of Capt. James Ford, a North Carolina patriot in the Revolutionary War, and his second wife, Ann Townsend Ford. John Ford married Catherine Ard, also a South Carolina native, in 1790. The two converted to Methodism in their thirties and resided in South Carolina’s Marion District. Becoming a Methodist minister, Ford was elected to and served in the South Carolina legislature for two terms beginning in 1798. By 1807 Ford joined and soon became a leader of a small colony of South Carolina relatives and neighbors who moved west into the Tennessee River Valley, originally settling near present day Huntsville, Alabama, and then moving to Mississippi, where they settled in Jefferson County near the mouth of the Bayou Pierre. Between 1809 and 1811 Ford and several of his brothers moved to the west bank of the Pearl River in what was then Amite County in the Mississippi Territory. That area, which became Marion County on 9 December 1811, was populated by many South Carolinians, who named the county after Ford’s home district in South Carolina. The geographic importance of the house was magnified by its proximity to Ford’s Ferry, two and a half miles away on the Pearl River. Operated by John Ford’s older brother, Joseph (1763–1825), this ferry was a significant crossing on the Pearl and gave access to roads east and west in the Mississippi Territory. The major post road from Fort Stoddard to New Orleans came to Ford’s Fort, intersecting with other post roads going west to Pinckneyville and Natchez, southwest to Baton Rouge, and south to Lake Pontchartrain and New Orleans. One of the first post offices in the territory was established at the house on 26 December 1812, and Ford served as postmaster until his death. The post office was originally known as Ford’s and before 1826 came to be called Fordsville. During the War of 1812 and the Creek War of 1813 settlers on the Mississippi frontier became the targets of Native American attacks, often encouraged by the British. In August 1813 Ford wrote to territorial governor David Holmes of the erection of a stockade and other defenses at the house. The fortified enclosure behind which the Fords and their neighbors gathered when the region was threatened came to be known as John Ford’s Fort. The high wooden palisade, located fifty feet from the house, surrounded it as a garrison. Parts of this stockade survived into the twentieth century. Ford became one of the territory’s most prominent leaders. A man of wealth, he owned 2,597 acres of land in 1819 and possessed forty-four slaves in 1815. Respected by his peers, Ford played a critical political role during Mississippi’s territorial period, especially in the creation of the state. As factions within the Mississippi Territory battled for statehood, the division of the vast territory became a contentious issue. On 29 October 1816 county delegates chosen by vote during local meetings of settlers gathered at the Ford Home to discuss the issue of statehood at what became known as the Pearl River Convention. Its primary purpose was to express to Congress support for admission of the Mississippi Territory as a state with its territorial boundaries intact. The memorial drafted to Congress argued strongly against the division of the territory and criticized earlier petitions supporting division as representing “a small section of our Territory, and from a small minority of our fellow citizens.” Seventeen delegates from fifteen counties attended, including Cowles Mead, who presided over the convention; noted Indian fighter and scout Sam Dale; and Joseph E. Davis. Ford served as the convention’s secretary. The convention dispatched Judge Harry Toulmin as its special delegate to Washington, D.C. Although he could not convince Congress to admit the whole territory as one state, the convention’s memorial was referred to a select committee and dominated discussions in Washington on this matter, much to the chagrin of Mississippi’s pragmatic territorial representative, Dr. William Lattimore. On 1 March 1817 Pres. James Madison signed the congressional act that enabled the inhabitants of the western part of the Mississippi Territory to form a constitution and state government. In June 1817 Ford was elected to represent Marion County as one of forty-eight delegates to the state’s first constitutional convention. Held at the territorial capital, Washington, this event lasted for six weeks in July and August. Ford served on the committee on rules and later on the committee that drafted the constitution. The constitution was approved and signed by its delegates, including Ford, on 15 August 1817. On 10 December Pres. James Monroe signed a congressional resolution that proclaimed the constitution a republican document and declared Mississippi a state. Ford’s house has also been called the Cradle of Mississippi Methodism. On 14 November 1814 the second conference of the Mississippi Methodist Church assembled there. Three years later Methodist bishop William McKendree visited Ford’s house and ordained him a minister before becoming ill with pneumonia, and he remained there for several months while Ford’s family nursed him back to health. On 29 October 1818 “Ford’s Meeting-house,” as Methodist records term it, was again the site of the Methodist annual conference. The feeble McKendree, still recovering from his illness, presided at the session, conducting many of the conference meetings in his bedroom. Four of Ford’s sons became Methodist ministers and circuit riders, and two of his daughters married Methodist ministers. One son, Thomas Ford, established Jackson’s first Methodist congregation in 1837. It is now Galloway United Methodist Church. Ford died on 14 February 1826 at his home and is buried in an unmarked grave in the nearby Ard Family Cemetery. Ford’s descendants retained ownership of the house and property, preserving it largely without change, until November 1962, when the Marion County Historical Society purchased about six acres of land, including the house and barn (built in 1909), to preserve the site for future generations. The restored house has been open to the public since June 1963. In 1971 the site was placed on the National Register of Historic Places.